At our Boston Dental Care office you’ll appreciate the soothing and relaxing atmosphere we’ve created. You can rest assured that your dental care is properly performed while you remain safe and comfortable. We offer stereo headphones, TV and comfy chairs. Our staff members make each patient feel important and cared for. We’ll strive to make your visit easy and enjoyable, ensuring a pleasant experience. You can be assured that with oral sedation or i.v. sedation, we can safely and easily take care of your dental needs in a few visits while you sleep. And with oral sedation, there is no extra fee. But even if you elect not to have sedation, there is a lot we can do to make your visit more comfortable. One way we do this is with The Wand™. The Wand has taken the fear, anxiety and pain out of dental mouth numbing injections. This computer controlled device delivers just the correct amount of anesthetic to numb your mouth. The microprocessor inside the Wand automatically compensates for the different tissue thicknesses. It provides the anesthetic at a constant pressure and volume that is typically below the threshold of pain. 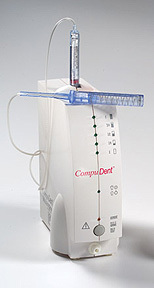 The computer provides a flow of anesthetic directly ahead of the needle. This numbs the tissue before the body of the needle arrives. Most patients don’t know that most discomfort from injections comes from the pressure of the flow of the anesthetic into the tissue. The Wand delivers the anesthetic at the optimal flow rate for an enjoyable experience every time. Come in and experience the difference advances in technology can make. You will never want to go to another dentist ever again. Ashamed and embarrassed of your dental condition? Don’t be. Dr. Thein has treated thousand of patients like you over the last twenty years. After patients have looked at our website patient photos, we are often asked: Are these patients actually the patients of Dr. Thein? Our answer is, yes—every single one of them. We used actual clinical photos to show you that, in the real world, patients like you exist. For several reasons, you may not have had the best of dental care before coming to our office. Dr. Thein understands that and won’t judge you or think less of you. He is sensitive to your needs and committed to getting you the best of dental care. If you consider yourself a dental coward, you have found an understanding friend.